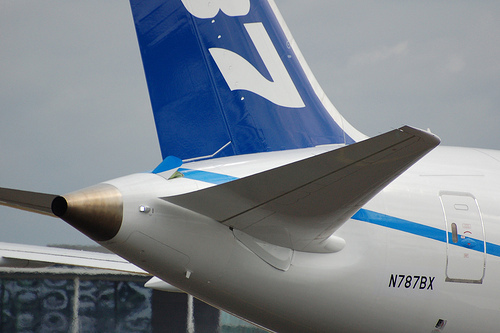 The horizontal stabilizers can be longer, they just don't need to be any longer than they are. Each additional square inch will add induced drag and parasitic (form / profile) drag which costs fuel so they're not made any bigger than necessary to provide adequate control of the plane. On most aircraft, the horizontal surfaces in the rear are horizontal stabilizers. These surfaces actually provide negative lift, which balances the center of gravity being forward of the center of the lift force. This balance of forces provides natural stability in a simple way, which is why is is the standard design for both large and small aircraft. Of course this negative lift is working against the main wing, which increases the drag, so this surface is kept as small as possible to provide sufficient stability with as little drag as possible. There is an aircraft layout called tandem wing, where there are two wings in a tandem configuration that both provide upwards lift. The tail surfaces of an aircraft are also called the "empennage", a term originating from the French word for the fletching of an arrow. The term thus indicates the purpose. The horizontal and vertical stabilizers are exactly that, stabilizers. Their purpose is to keep the plane's fuselage in line with the relative wind caused by the aircraft moving through the air. Without them, the plane could easily enter a sideslip or a tumble. They also provide pitch and yaw control by redirecting the relative wind upward or downward, having the opposite effect on the airframe (Newton's third law). They are not intended to generate lift to counter gravity, and in many cases the horizontal stabilizer does just the opposite, providing a downward force on the back of the aircraft through a combination of negative pitch and "downwash" of air from the wings. This keeps the nose up during forward flight, compensating for a slightly nose-heavy weight distribution which in turn provides desirable flight characteristics such as the tendency to nose-down in a stall (if you're going to fall out of the sky, you might as well fall in an attitude that restores a low angle of attack and thus has the potential for you to recover). Therefore, in a traditional configuration, they aren't any bigger than they are because they don't have to be. A larger horizontal stabilizer will increase drag due to the greater surface area and volume of displaced air, for no real gain. Potentially the control surface area could be increased, but there is a limit to how big they can be before the forces acting on the control surface in a deflected position exceed the materials strength of the control surface or the airframe. Even before that, larger control surfaces make the plane more sensitive to stick/yoke input, which is useful for a fighter or aerobatic airplane, but potentially deadly for a plane designed for use by the "everyman" pilot. As already noted, they can be, but are not, in order to reduce drag. In general, the horizontal stabilizers in present generation of aircrafts are smaller than their predecessors. This is a result of the advances in design the aircraft with the introduction of fly-by-wire systems. The horizontal stabilizers are designed to give stability to the aircraft by giving a negative pitching moment. The aircraft wing, in itself is unstable. As lift is generated, the wing pitches up, which increases the angle of attack, increasing lift. This process goes on till the wing stalls. The horizontal stabilizer is effectively a smaller wing located at the other side of the center of gravity at a longer distance, negating this pitch up moment of the main wing. So, basically the horizontal stabilizer produces a positive lift, but a negative pitching moment. The bigger the horizontal stabilizer is, more the lift and stability, but also the drag. One way to reduce the drag is to have a smaller horizontal stabilizer, but this reduces stability, requiring the pilot to continuously adjust the controls to fly the aircraft. However, the introduction of computer controlled controls (fly-by-wire systems) meant that the aircraft could be unstable, with the computer adjusting the controls continuously to achieve stable flight. 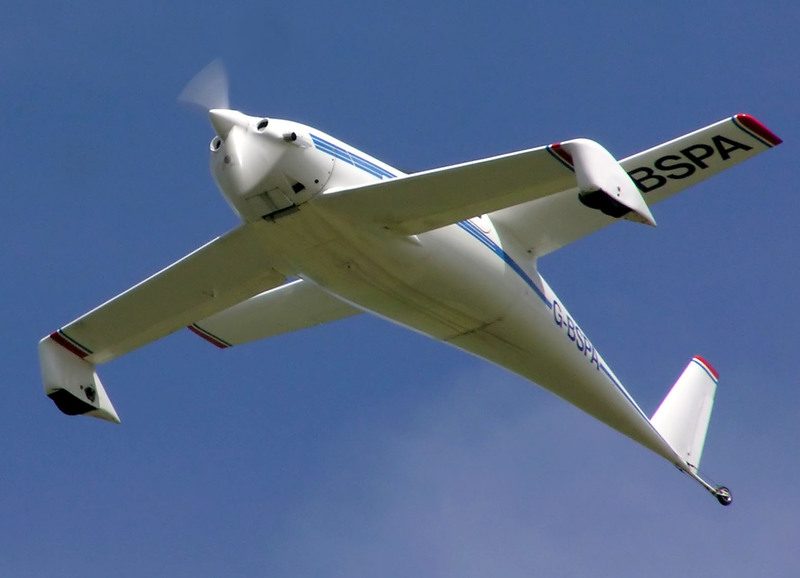 As a result, the aircraft designed after 1990's mostly have fly-by-wire control systems with smaller horizontal stabilizers, resulting in less drag and decreased fuel consumption. As an example, compare the horizontal stabilizers of DC10 and MD11. The MD11 was based on DC10, with stretched fuselage and increased wingspan, however with a smaller tailplane. This was achieved using a (partially) computer controlled horizontal stabilizer. As can be seen from the image, the horizontal stabilizer in the MD11 was smaller than the DC10, though the aircraft was larger. Relaxed stability designs are not limited to military jets. The McDonnell Douglas MD-11 has a relaxed stability design which was implemented to save fuel. To ensure stability for safe flight, an LSAS (Longitudinal Stability Augmentation System) was introduced to compensate for the MD-11's rather short horizontal stabilizer and ensure that the aircraft would remain stable. However, there have been incidents in which the MD-11's relaxed stability caused an "inflight upset." Concorde designers took a different approach: they removed the horizontal tail planes to decrease drag as much as possible. Every unnecessary thing (pod/pylon/etc.) on the outside of the fuselage or under the wings add drag, even without generating lift. Another historical example is the MD-11, evolution of the DC-10. If you notice, the MD-11, even if longer and heavier, has smaller tail planes for better cruise performance. What is this open panel at the rear of this airplane? Why does the DC-10's horizontal stabilizer have such a pronounced dihedral? Would a slower and larger rotor blade be practical? Why did Concorde not have horizontal stabilizers? How do endplates reduce induced drag?